Corral's Martial Arts is rated one of the best Brazilian Jiu-Jitsu schools in Northwest Indiana. Corral’s Martial Arts is rated one of the best Brazilian Jiu-Jitsu schools in Northwest Indiana. At their academy, you will find students seeking martial arts training for many different reasons. They are known for their technical ability and have some of the highest ranking instructors in the region, with all Brazilian Jiu-Jitsu Black Belts certified by the IBJJF from Rio de Janeiro, Brazil. CMA needed an edgy, bold, and strong logo which was achieved through a thick sans-serif font, with sharp corners and angles, to convey the strength that the sport represents. The business was also in the market for a fully responsive website, which would communicate effectively and function properly on all devices. 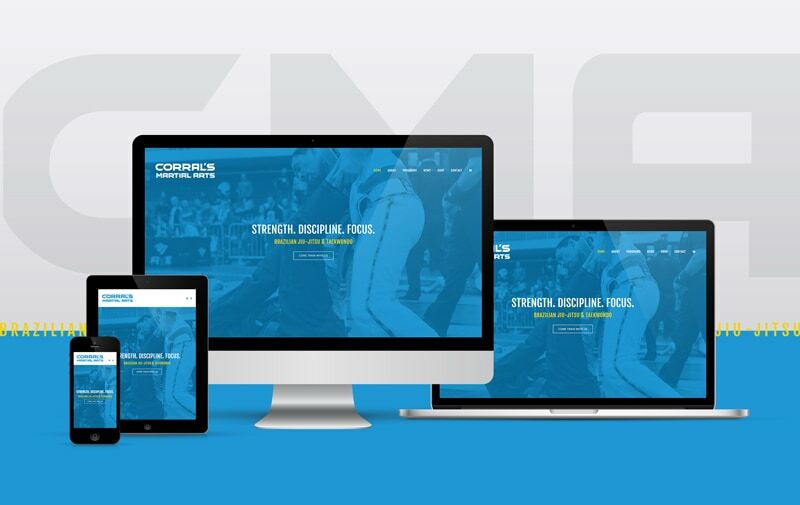 By utilizing full-screen menus, strong typography, exciting imagery, and vibrant colors; Corral’s Martial Arts truly shines online just as the academy does on the mat.